In making tonight’s dinner, I was thinking that it would be wonderful if Americans would treat potatoes as a vegetable instead of as a starch. This is commonplace in Indian cuisine, with dishes like aloo gobi (potatoes with cauliflower) or in Sichuan dishes like shredded potatoes in vinegar sauce. A rich and hearty cold-weather dish, this combination of flavors is perfect for a day like today, where the temperature dipped into the low 40s in the first week of April. Scrub fingerlings and thinly slice with a small vegetable knife. The slices should be paper thin or as close as possible. Alternately, slice on a bias, making sure that the slices are roughly 3/8″ thick. This will increase cooking time so adjust accordingly. Steam until barely tender, about 8 to 15 minutes depending on the thickness of the slices. Place in a bowl; cover to keep warm. Heat olive oil in a saute pan over low to medium heat. Add cabbage and a pinch of salt. Cook, stirring frequently over medium heat until cabbage becomes translucent. You don’t want to increase the heat or else you’ll run the risk of turning the cabbage a dull green. Add potatoes after about 3 to 4 minutes. Check seasoning. One common mistake that I find people make when they cook is that they don’t season often enough. Your finished dish shouldn’t need any salt or pepper provided you’ve adjusted things as you go along. Add butter. Stir frequently, making sure to coat the potatoes and cabbage with the melted butter. Cook the potatoes and cabbage over medium to medium-high heat or until vegetables have started to lightly caramelize. Check seasoning once more. Meanwhile, prepare rotini. Drain. 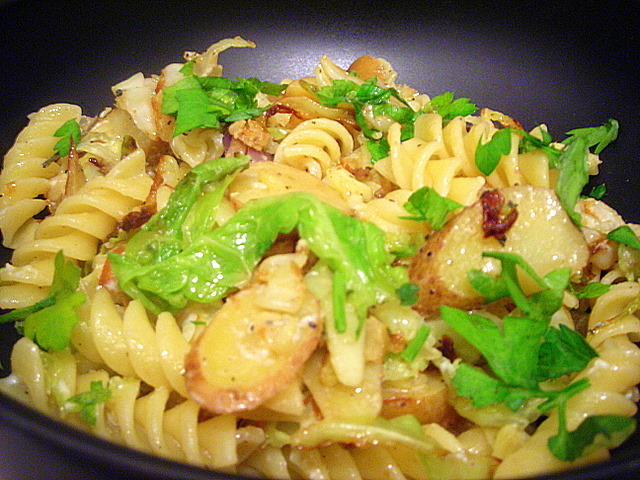 Fold pasta directly into potato and cabbage mixture. Add fromage blanc and stir to incorporate. Remove from heat. Sprinkle with grated cheeses and chopped parsley. Serve immediately. 08 Apr	This entry was published on April 8, 2009 at 12:01 am and is filed under food, general, vegetarian. Bookmark the permalink. Follow any comments here with the RSS feed for this post. You know, a non-cooking friend of mine always tries to insist that the french fries she loves are a “vegetable”. I’m not buying it. Much as I love potato-based dishes, I really am disinclined to view them as anything other than, technically, a starch. But I know what you mean. Also, I find the texture of new potatoes or fingerlings to be very different and — depending on recipe — much more “vegetable like” than something like a big, dry Idaho russet. I don’t think I’ve ever had spuds in pasta, but they can be quite delicious on pizza. It’s both a textural and a flavor thing, especially when you use new varieties like Purple Peruvian or La Ratte. I don’t think people are going to start using potatoes in pasta on a regular basis. On the other hand, this post was just something I’d been thinking of doing for a while, not to mention it’s cheap.